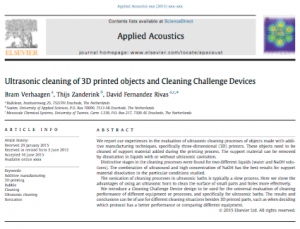 We recently published an article on (ultrasonic) cleaning of 3D printed parts in the Applied Acoustics journal. Additive manufacturing techniques were invented several decades ago, but it was not until recently that three-dimensional (3D) printing has become popular and has pushed the imagination of users. The discovery of new functions and applications of relevance for many fields has been possible with the advent of 3D printing. Recently 3D printers have been used to fabricate spare parts for space missions, the printing of organs for transplantations, and novel structures and chemical reactors. However, some 3D printers produce objects that need to be cleaned before they can be used. 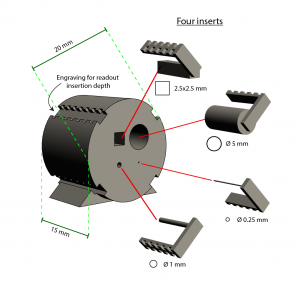 In our article, we describe the best ways to clean and evaluate objects made with 3D-printers. The cleaning method typically used and endorsed by manufacturers is tested and new methods of cleaning are introduced. Using water and other chemical solutions in combination with an ultrasonic bath yielded different results. Distinctive stages in the cleaning processes were found for two different liquids (water and NaOH solutions). The combination of ultrasound and high concentration of NaOH has the best results for support material dissolution in the particular conditions studied. Also, it was found that ultrasonic horns could be used to clean the surface of small parts and holes more effectively. A novel method for determining cleanliness is introduced in the form of a Cleaning Challenge Device (CCD), which can also be found elsewhere on our website. This device is designed to be a universal way of determining the effectiveness of a cleaning method and to help determine the best cleaning method per 3D printer. Read more? Visit our page on 3D printing and cleaning.